I have a solar system in my pool and just eight months ago, I had a situation with it. I was impressed that after so many years later, I called them back and they didn’t treat me like they were done with me. It didn’t benefit them financially at all, but they were still willing to help me. I really appreciated the fact that they were receptive to whatever questions I had and they were extremely courteous. 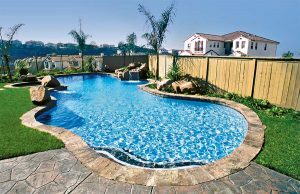 When it comes to swimming pools for San Diego backyards, homeowners have trusted the Blue Haven name for decades. Thousands of San Diegans have turned to the familiar “diving lady” symbol for designing and building their family an attractive, high-tech outdoor retreat. Our idyllic So Cal climate makes enjoying a beautiful outdoor space possible nearly year-round. From Chula Vista to Carlsbad, from El Cajon to Point Loma, the varied terrain of our local backyards often provides a perfect backdrop for a distinctive inground pool & spa, complimentary decking, landscaping, and other great outdoor amenities. Is your home perched on a canyon with a great view? We can help take advantage of that with an infinity-edge pool that seemingly melts into the horizon. Have a slope or hill on your property? A bold, raised wall that integrates with the pool structure might be a superb solution that’s both functional and stylish. 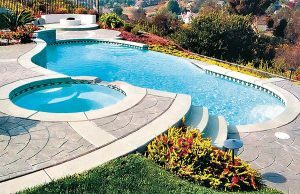 Or, that slope can help serve as a foundation for a massive rock waterfall that takes center stage on your pool’s layout. Looking to build a liquid playground in a tight space with narrow dimensions? 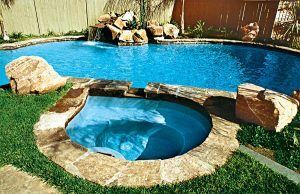 Blue Haven experts can design a large custom “spa only” or a compact, hybrid “spool” that delivers some of the benefits of both a pool and spa. Along with an impressive new pool & spa that enhances your home’s exterior, we know you may have other concerns when it comes to pool ownership. For many Californians, responsible use of natural resources and protecting the environment is part of our way of life. And in San Diego, most homeowners would like to minimize their water use and SDG&E bills. With this in mind, Blue Haven places special emphasis on using water- and energy-efficient pool technology. Our full line of environmentally friendly equipment includes automated controls, vibrant LED pool lighting, and variable-speed pumps. For pool heaters, we use only California-approved low-NOx models that boast high ratings for thermal efficiency. Of course, solar-energy heating systems may also be an option to consider. Every pool we build also includes our exclusive circulation system that helps cut the number of daily hours that your pool pump and heater will need to operate. The other precious local resource we want to use wisely is water. Toward this goal, we use only cartridge filters on Blue Haven pools. Along with requiring only one or two cleanings per pool season, a cartridge-type filter does not require water-intensive backwashing. As an added plus, these filters exclusively feature Microban antimicrobial product protection. Mother Nature—as well as your family’s eyes, skin, and lungs—will also appreciate our water-sanitizing system. Instead of harsh chlorine, along with noxious fumes and byproducts that it can produce, you can opt for pool water that relies on gentle, effective ozonation, natural minerals, and UV germicidal light. With thousands of Blue Haven pools built in across San Diego County, you can rely on the Blue Haven name for your backyard dreams. Our local team even boasts a unique advantage within the U.S. network of Blue Haven offices: They can easily draw on corporate resources from Blue Haven’s national management headquarters, located nearby in downtown San Diego. Ask about our network of financing sources for pool loans (oac). For certain payment phases on your new pool, we even accept Visa and MasterCard.